Sun hats have been making a bit of a comeback in recent summers, and it’s easy to see why. The best sun hats not only provide you with all-important protection when Mr Sun is at his zenith, but look dapper while doing it, and our pick of the top toppers from across the shops ace it on both fronts. Welcome to your most stylish summer ever. For most of us, Just-Boiled Lobster isn’t the desired shade to end up with after a day out in the sun, so our first pick is a hat that keeps you looking cool on two fronts. Roxy’s Ocean Dream Straw Sun Hat comes in a choice of two sizes to suit most head shapes, and packs in a large brim to keep the sun away from your face’s delicate skin, all the while looking amazing in its space-dyed effect blue and white. If you’re more of a summer hat purist, go for classic, easygoing neutral tones with Joe Browns’ Costa Rica Bead Trim Hat. Of course, while straw and raffia hats are warm-weather classics for a reason, they aren’t the be-all and end-all – for more of our top picks for summer 2018, keep reading below. This Roxy hat is simply oozing nautical style with its fresh-looking blue and white colourway, a trendy twist on the classic neutral straw hat, and big floppy brim. That brim not only looks impossibly glamorous, it’s also your first defence against burning and premature ageing on delicate facial skin, so we’d say that makes it a pretty essential packing item. Add in a delightfully nautical touch courtesy of the rope detailing, subtle Roxy branding, and a choice of sizes, and you have our best sun hat. We get it, large brims aren’t for everyone. If you’d rather project a more laid-back air than is really possible with an oversized straw hat, a straw trilby is a great alternative, and we think this one from Ted Baker is the most stylish of the bunch right now. The cutwork details on the crown don’t just look cool, they also provide extra ventilation on those really hot days, reducing the likelihood of wilted hat hair when you eventually hang it up. 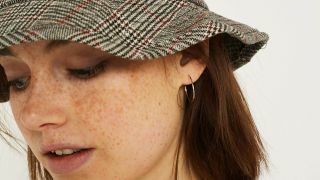 The patterned band is a stylish addition, too, adding a quirky tailoring-like detail to an otherwise quite casual hat. A hat that admirers will reasonably believe you picked up on your gap yah, but is actually from Debenhams? That’s a win-win if we ever saw one. This hat’s aptly Latin name sums it up quite well, with an easygoing traveller’s air about it, and artisanal-looking details like colourful woven bands, fringing, brightly coloured stones, rustic leather lacing and found details like beads and coins. It sounds like a lot, but against a backdrop of soft, flexible and neutral woven fabric, it’s just right. Couldn’t get tickets for the No Filter tour? No sweat, this Rolling Stones baseball cap lets you rep the band without queueing for two hours or paying way over the odds at the merch stand. In classic baseball cap style, it has a narrow curved peak, ideal for those who aren’t entirely sold on oversized snapbacks. It’s made from 100% cotton for maximum natural breathability on hot days, but unlike most untextured caps, it has a ribbed cord-like finish that adds interest on top of those unmistakable band patches. If straw beach hats that wouldn’t look out of place on the sands of St Tropez aren’t really your speed, why not go for one that wouldn’t look out of place in a field in Knebworth in 1996? Of all the throwback fashion popping up in the past couple of years, we have to say bucket hats were the item we least expected to make it another round. And yet, here they are, and making more of a splash than is decent. This checked version from Urban Outfitters is our best for ticking all the boxes, with a brim just wide enough to keep the sun off your face and a print that’s set to stand out.